I love duochromes. 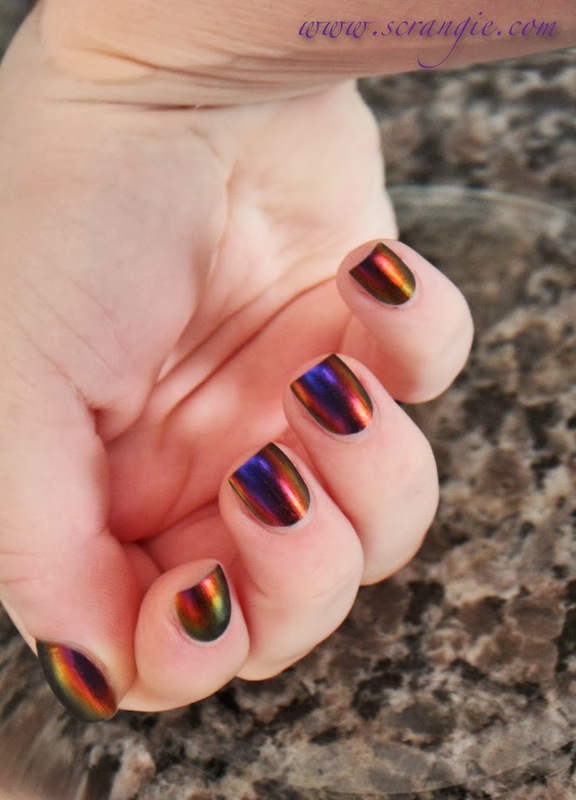 Multichromes. Whatever. I love them. A lot. Until I try to photograph them, at least. You should see me spinning in circles with my camera in my hand, tilting back and forth trying to get the angle just right, it's hilarious. And that works, usually, but I still end up taking way too many pictures to capture all the ways the color shifts. 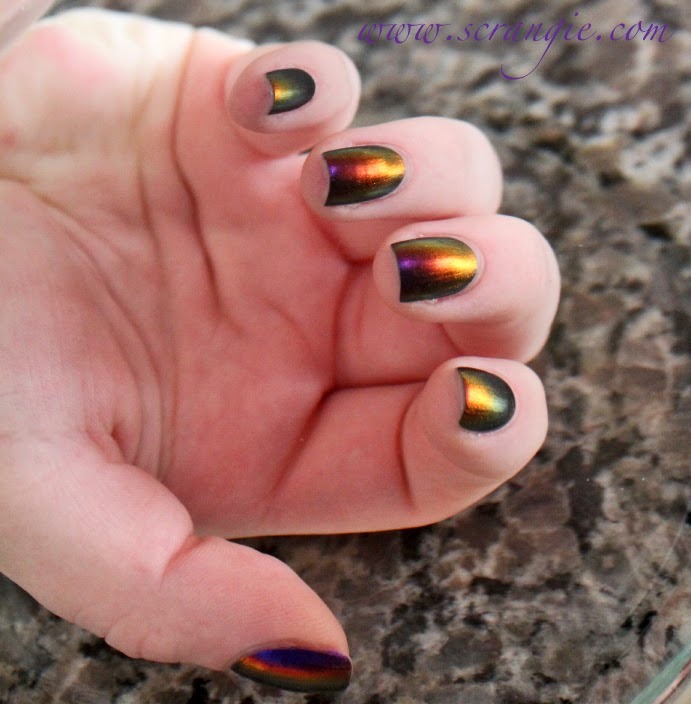 Waaaayyyy back in the day, when I was swatching Sally Hansen Nail Prisms, a bunch of you suggested that I put my hand underwater when photographing duochromes to capture the color shift better, and I was amazed at how well that worked. The only problem was that I found it awkward, what with the water and the lighting and trying to figure out how to hold my hand so it didn't look all mangled and distorted, so I told myself I'd try it again when I had more patience and then kinda forgot about it until a couple of weeks ago. I thought I'd share a couple of my test pictures because they turned out pretty cool. I'm using a large glass bowl filled all the way with water, and it's still pretty awkward (and my hand looks very weird through the water), but the color came out PERFECTLY. I think I just need more practice. The polish I'm wearing is I Hit My Bunny Phone by Girly Bits Cosmetics, and it is amazing. A+ mega ultra multichrome that isn't sheer. Can't say enough good things about it. The photos will attest to its amazingness. Beautiful photos! I find it easiest to take underwater photos with a large, flat pan full of water - I just keep my hand flat in it. Just... WOW! I need this haha. It's pretty amazing how the water works so well. So cool! I can see how it would be a little weird to get the angle you want and then still shift a little to take the picture with your other had. Personally I will probably not try this because I will drop my camera in the water. It would happen. That's just who I am. These shots show the color a-mazingly, though. I love the way these came out!!! It really shows off the spectrum of colors in the polish! So pretty! wow!!!! :O this is amazing! 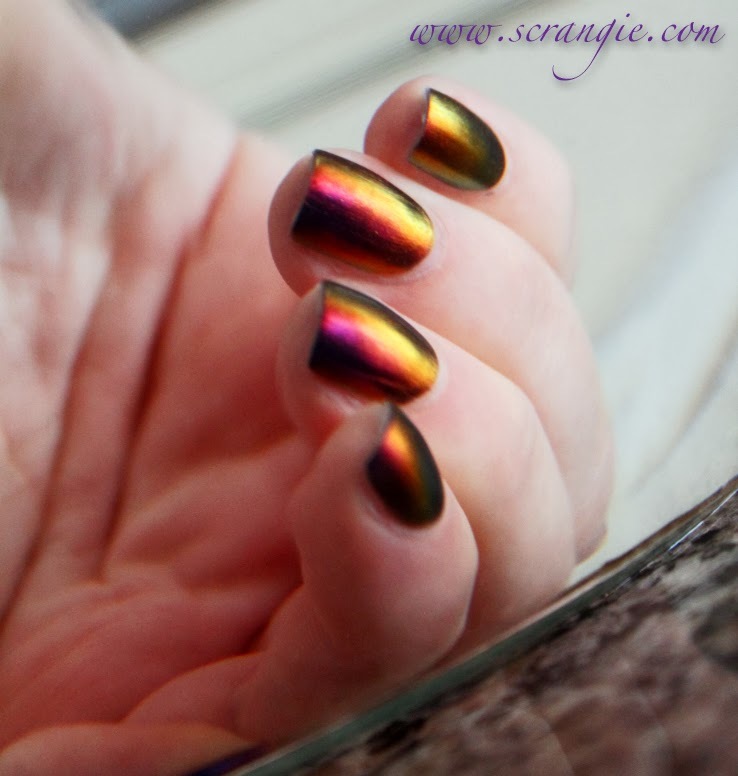 This is stunning, reminds me of Dance Legend Chameleon Collection, also very nice multichrome polishes! Aha! I was just wondering recently about the underwater photo thing. I could never manage it either, although I'd heard everyone talking about it. Maybe I'll give it another try too. Oh, my, another aEngland polish that I have fallen in love with. Is every polish they produce beautiful or what?! And you present it wonderfully. Wow, those underwater shots are gorgeous! Long time reader, first time commenter. I absolutely love this color! I think I would kill someone to get this color...seriously...maybe seriously. I ordered this after seeing these swatches. What a beauty! I've actually figured out a good way to do the underwater photos. I use a large, smooth glass bowl and fill it up as far as possible to allow for the water displacement when I submerge my hand. I stand on a small step stool so that I don't have to bend my wrist at a strange angle and to keep my arm from knocking over the bowl. I wrap my fingers around a tall, clear shot glass. 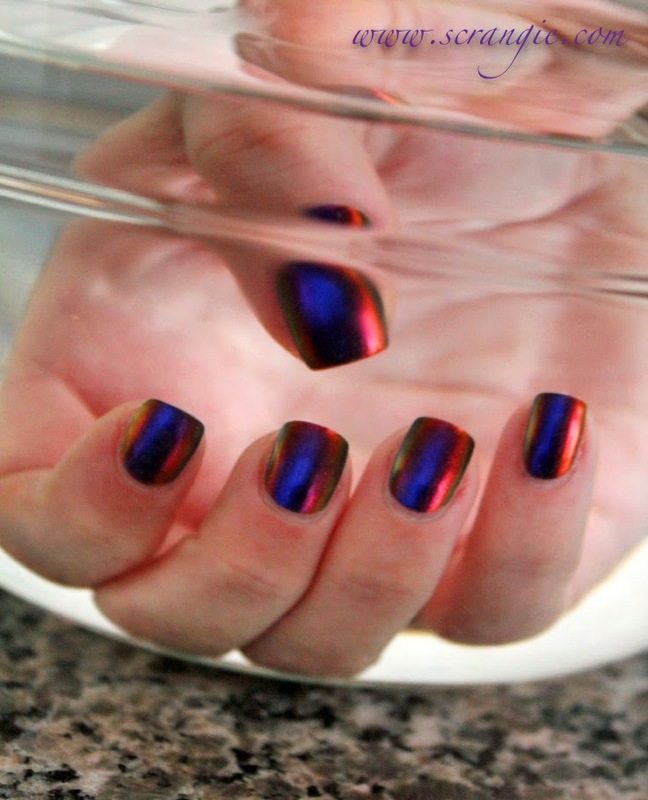 The underwater effect is really amazing - gorgeous swatches! Gorgeous underwater shots! I use a clear bowl of water for my multi-chrome pictures. I stand on a small step stool so that I don't have to worry about having my arm/wrist at a strange angle. And then I use a clear shot glass in place of the bottle of polish.